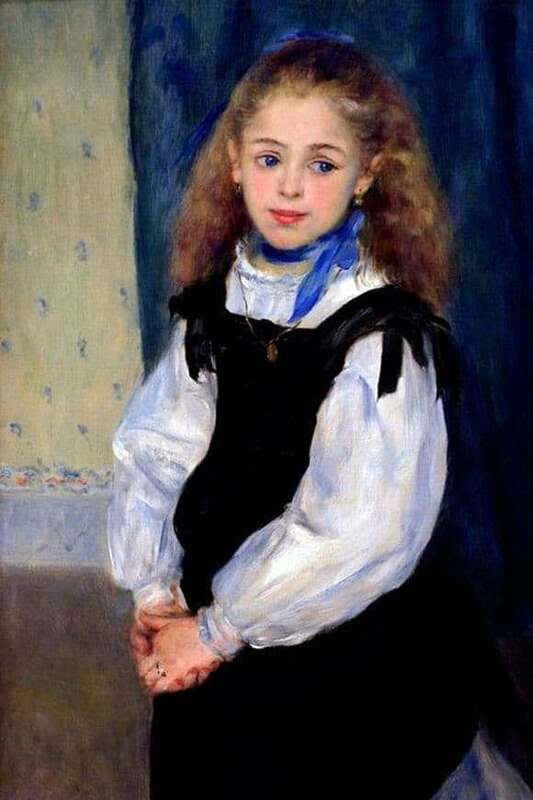 The charming portrait of the eight-year-old Dolphins Legrand was painted by Renoir in 1875 at the beginning of his artistic career, when the painter depended on the decisions of the portrait commission to ensure his life and creative work, earning the fame of the artist. Hands folded, the girl stands in an indecisive posture. Her defenseless look is directed somewhere to the side and as if looking for support. The portrait of the Dolphins is made with clarity of details, saturated bright colors prevail: a black apron is painted with wet brush strokes, a blue scarf is tied around the neck with a blue scarf behind it, and a blue curtain tinted with greenish paint. Her golden medallion is very characteristic of childlike spontaneity – unevenly, as if moments ago was taken out from under the apron to decorate clothes. Parents Dolphins belonged to the petty bourgeoisie: the father was a trader, and the mother made straw hats. According to extant data, a picture from the girl was ordered by her grandfather, who wished to exhibit works of impressionists in his shop. The granddaughter came out on the canvas as a childishly charming and a bit constrained. This work by Renoir awakens memories of the carefree world of childhood. Along with other portraits of women and children who were so much loved by the Impressionists, the artist’s reverent attitude towards a tender human being is read in the work of Mademoiselle Legrand. Renoir’s paintings are striking life-affirming power – they are romantic, bright. The Dolphin girl is written with the same kind of love and joy. The sweet creature shyly lowered her gaze, and the bright sapphire drops of her eyes shine with unprecedented beauty. With bold, quick strokes in the characteristic impressionistic style filled with oil fragments, details of the appearance of Mademoiselle and a colorful background. Renoir again skillfully glorifies youth and the charm of life.